Note: Families will be asked to sit on the floor/stage in a circle with the dancers. We encourage the children to laugh, talk and join in as much as they feel comfortable. Show is wheelchair accessible. An exciting opportunity for 0-4 year olds (and their adults), to enter a realm of mystery, fun and adventure. Innocence is a unique playroom performance where the audience explore William Blake’s Songs of Innocence. 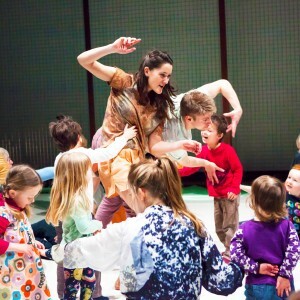 Innocence invites children to join an interactive journey of theatre, story and live music. A beautiful, captivating and innovative dance experience.